“Nexus is all about offering low noise solutions and this is exactly what you get. As a "straight from box" solution, there is very little on the market today that will offer such noise levels for standard frequency Core i7's and (more comfortably) Core i3/i5's and Phenom II processors. The Nexus VCT-9000 cooler offers a variable-speed 120mm PWM fan, HOC (Heatpipe-On-Core) technology and SkiveTek tripe-size ultra-thin fins. 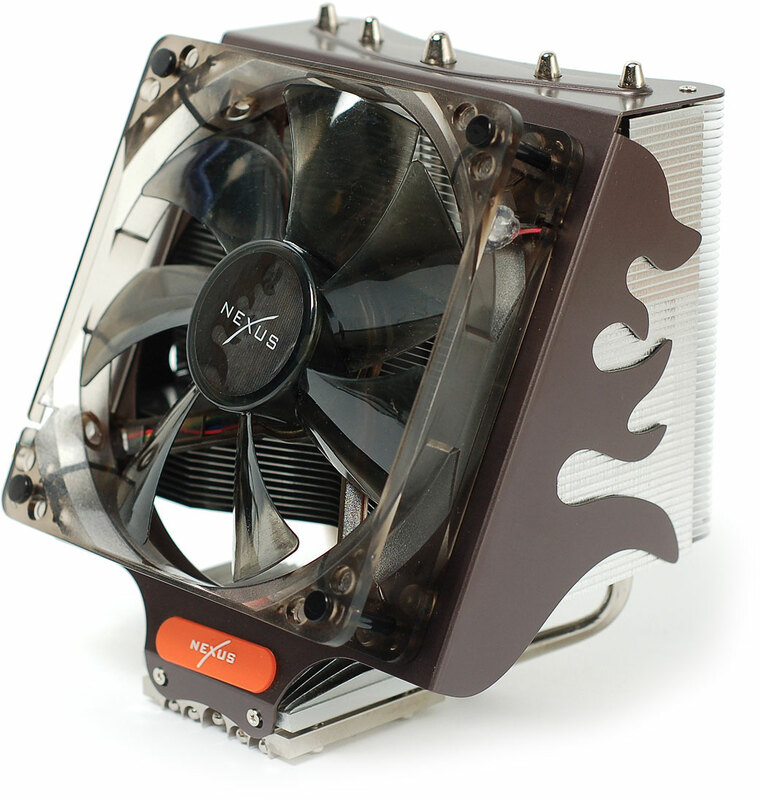 The Nexus VCT-9000 cooler combines some of the most advanced technologies in the market used for CPU coolers: heat pipes directly touching the CPU core, SkiveTek fin planing technology with three types of ultra-thin fins, and a real silent PWM controlled 120mm fan mounted at a 25 degree angle. The 120mm fan is PWM controlled and its speed varies between an incredibly low 500 RPM and an enthusiastic 1600 RPM, allowing the choice of perfect balance between noise and temperature. Furthermore, the fan is fitted with four blue LEDs. The five heatpipes (one 8mm and four 6mm diameter) are fitted using the advanced Heatpipe-On-Core™ (HOC) technology to guarantee the fastest heat dissipation possible. The Nexus VCT-9000 has three differently shaped aluminium fins. 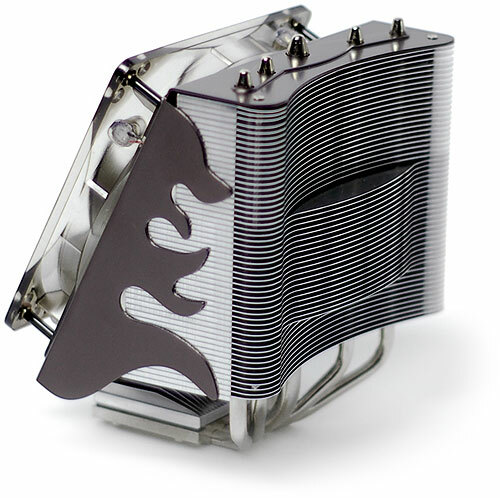 The bottom section of the fins has a characteristic V-shape which allows the airflow generated by the 12cm fan to reach the prime target area on top of the CPU core for effective cooling. When you compare this solution with a side-blowing CPU cooler, you notice that this area is not touched by the airflow of most of those models. This is a clear advantage for the VCT-9000 compared with side-blowers. 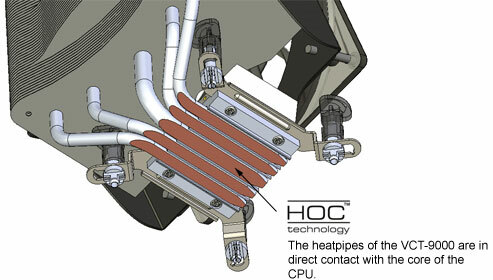 Heatpipe technology is the most effective way to quickly transport heat from one place to another. By placing the heatpipes directly onto the core of the CPU you make use of this benefit in the most effective way. Heat is absorbed directly from the CPU core. 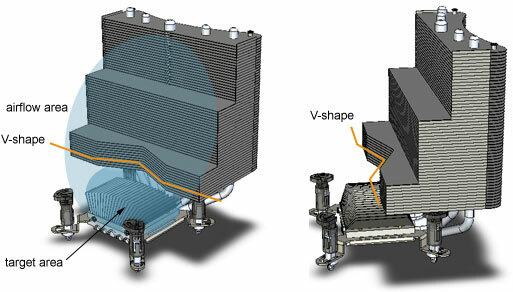 In contrast, many coolers on the market have a base plate onto which the heatpipes are positioned. This inevitably causes heat transfer inefficiency and a loss of performance.